Some orchid species have more appropriate names than others and this one is spot on as ‘decumana’ means large flowered. The 7cm flowers on this species rather dwarf the 5cm plant which here is mounted although we also grow the species in small pots and baskets. This plant was divided about twelve months ago and has become firmly established to its new mount with extensive roots clinging to the bark. Our philosophy when it comes to mounting plants is to always use bare cork with no added moss and to fix plants firmly with a twist of thin green wire through two drilled holes. Our observations in the wild indicate that orchid roots like to be firmly attached to the bark of the host tree and we find that in cultivation the same applies. 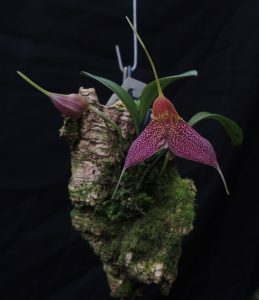 the moss on this cork has all arrived naturally since mounting last January and shows the cool damp conditions we provide for our Masdevallias. Masdevallia decumana is native to cloud forests in Ecuador and Peru from 1000-2500m. We find it enjoys Cool Americas (Min 12C) where it is kept well watered all year.